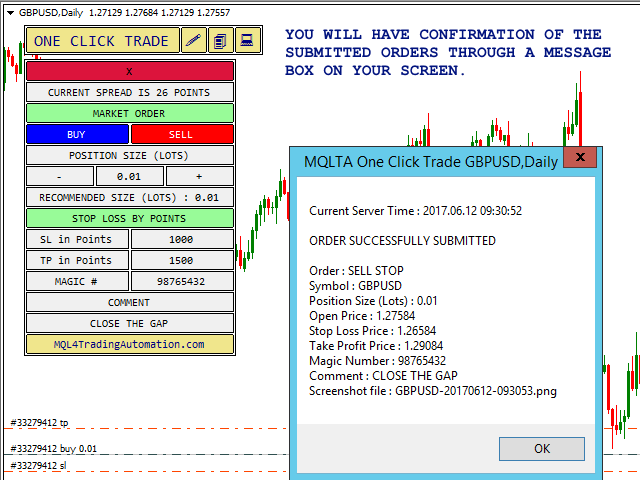 One Click Trade is a tool that allows you to open orders with just one click, choosing all the parameters, including the Magic Number! 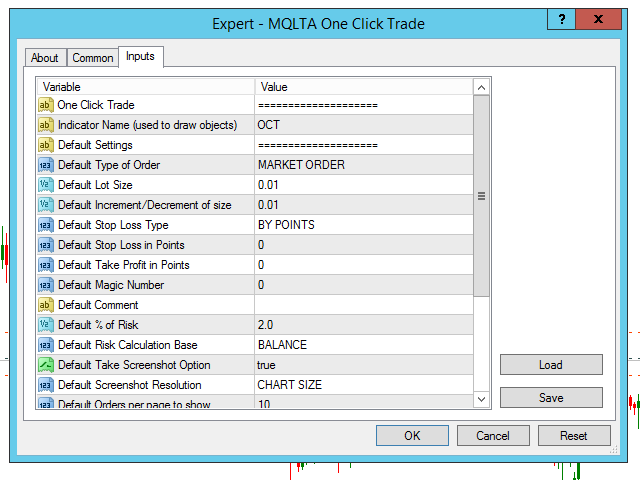 Useful if you want to quickly submit trades specifying also their Magic Number. 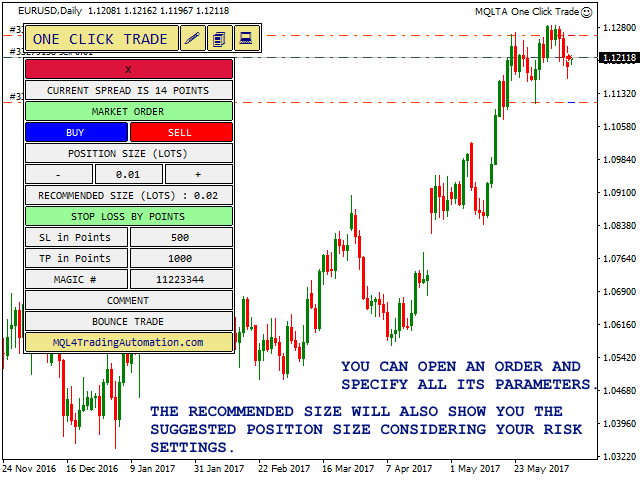 Other than submitting new orders you can also see the list of orders (with their Magic Number) and change their Stop Loss and Take Profit. 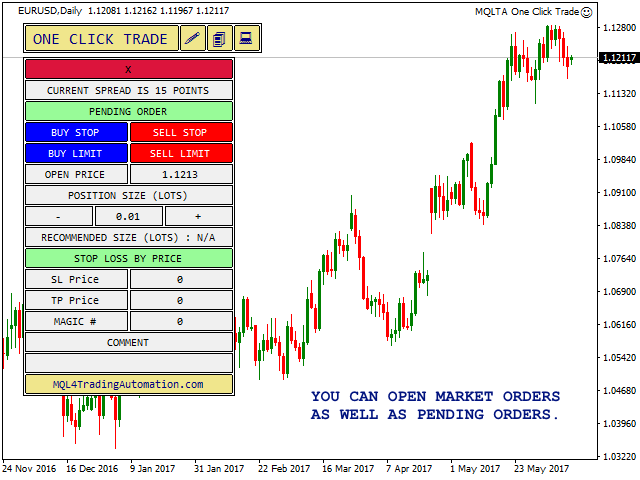 One Click Trade shows you a friendly interface to submit market and pending orders and viewing current orders. Intuitive and quick to use. 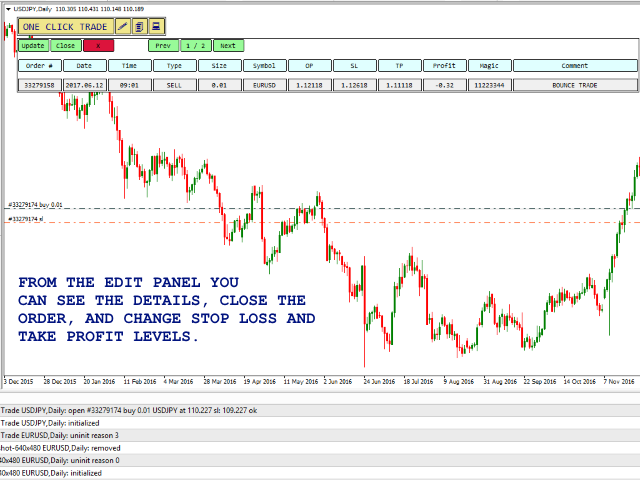 In the New Order Panel you can submit new market and pending orders specifying the position size, stop loss, take profit, Magic Number and Comment. 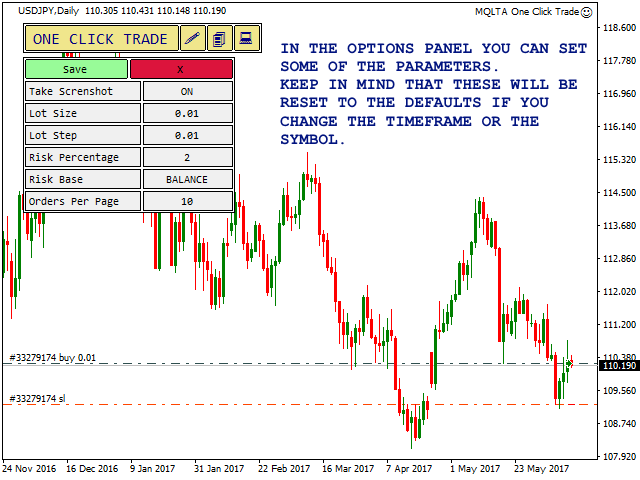 The panel will show you the current spread for the symbol and, if a stop loss is set, the recommended position size to satisfy your risk management. When submitting an order a message box will confirm the submission. 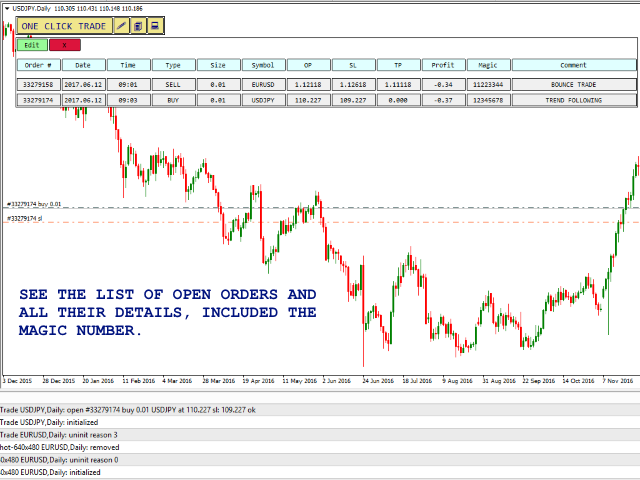 In the Order List you can see the list of current orders and all their details, from here you can also open the Edit Panel which allows you to change the Stop Loss and Take Profit levels and also close the order. The Options panel is useful to change some of the settings however these settings are always reset to the default ones if you change the timeframe or symbol. 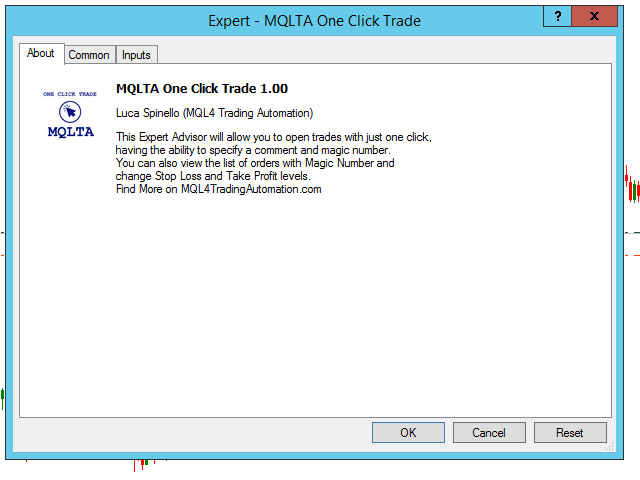 Why you should use the One Click Trade? Indicator Name - Prefix to create the graphical objects, suggested to leave default. 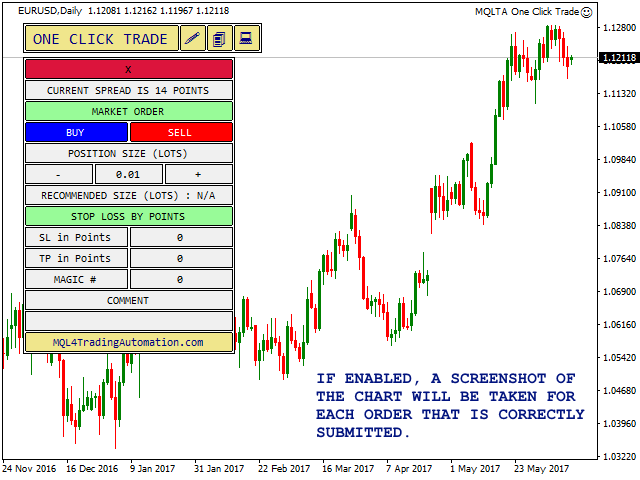 It is a useful tool for trade. Congratulations on the fixed and error-free programming. Very Good. I love comment in the New Order Panel. Author was very helpful and did a great job making this tool so easy to use! Was looking for something to quickly calculate trade size for better risk management than what I was doing. 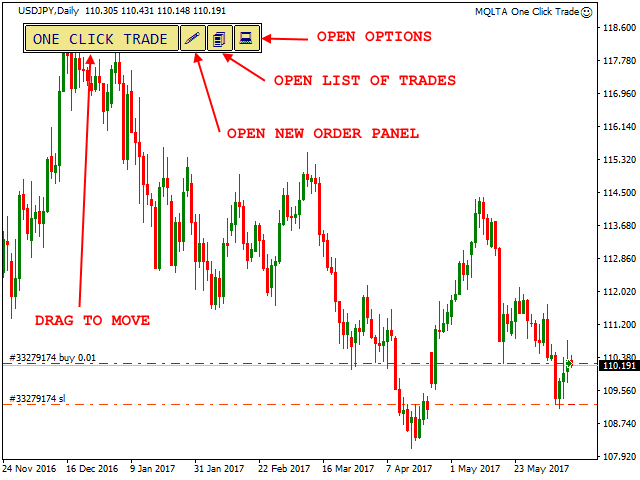 Came across One Click Trade - works perfect, and now using to place my trades. Speedy question reply from developer and open to suggestions.